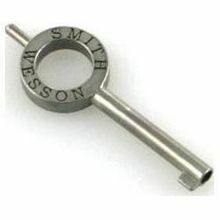 Genuine S&W handcuff key - one key. Fits S&W Models 100, 300, 1850 and 1900. Stamped with maker name. This key is thicker and stronger than generic cuff keys. If you need the key for the S&W High Security Mod 104, use the dropdown menu to choose it.